Yes, you read correctly, a self-cleaning juicer. Froothie are just about to launch this rather clever machine to the UK market. You put your chosen fruit or veg in a sealed bag and the Juisir squeezes it with the force of two elephants, until there’s very little left. Watch the video below to see how much juice you can get from wheatgrass, kale, carrots and cucumbers. The bags can then be washed or thrown away, depending on whether you’ve opted for a reusable bag or disposable ones. I was relieved to hear the disposable bags are compostable, so my greenwash detector can be retracted – for today at least. You can see from the pictures below, that the Juisir is elegant with clean lines and is simple to use. It comes in silver, black or red. Personally I like the look of it and I’m quite excited at the prospect. I’m hanging out for a red one, of course. It’s meant to be quieter than most juicers too. It’s a bit pricy to be sure, but it’s a high quality cold-pressed juicer that can be used again and again. If it’s easy to clean and looks good enough to keep on the counter, it’s more likely to be used on a regular basis, making it much better value. Head over to Froothie’s Juisir page to find out ten reasons why you need one. Scroll down to the bottom of the page for the price, discounts and order information. I get a lot of carrots in my veg box. It can be a bit of a struggle to use them all sometimes. 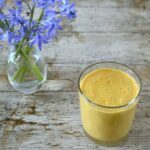 This carrot smoothie with ginger & orange is one of the ways I use them up. It produces a vibrant orange coloured smoothie which is brimming with flavour and vital nutrients. One glass of this keeps me going until lunchtime. Ginger and orange are both tried and tested pairings for carrots, so why not use both? I actually used a blood orange in this particular smoothie, but any orange will do. I also added turmeric as I try and get a daily dose to ease my aches and pains. It works too. My Optimum G2.3 induction blender is my smoothie workhorse. I use the large jug to make double quantities, so we have enough for two days running. The ingredients for my morning smoothies are organic as I like to start the day on a healthy note. It doesn’t usually stay that way. If you’re using carrots and oranges that aren’t organic, make sure you scrub them well. As we make copious amounts of kefir, this is what I use in our smoothies. If you don’t have kefir substitute a third yoghurt and two thirds water. If you’re vegan you can substitute it for the liquid of your choice. Do you have any tips for getting our ten a day? A vibrant morning smoothie full of colour and flavour to set you up for the day. Place everything, except the orange peel, in a power blender and blitz until smooth (I used the veg setting on my G2.3) . I prefer my smoothies unsweetened, but you can add a tsp or two of honey if liked. We have an ongoing task of using up the carrots in our veg box before the next lot arrive. 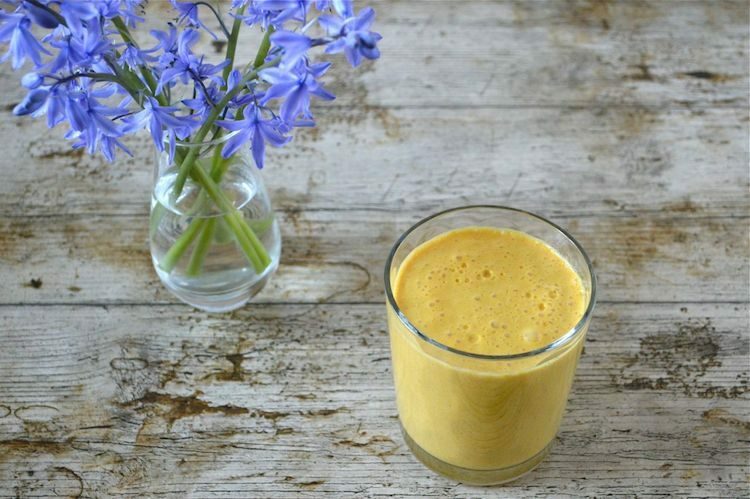 This carrot smoothie with ginger & orange is a good way to use some of them. I’m sending it to the No Waste Food Challenge at Elizabeth’s Kitchen Diary. Carrot Smoothie with Ginger & Orange. PIN IT. The Juisir comes with a reusable bag plus 30 cotton refills or 80 disposable bags and a two year warranty. It costs £579, but if you order one in the next eleven days you can get an earlybird discount. Use EARLYBIRD100 when checking out to get £100 off. As a Froothie Ambassador, I can also offer Tin and Thyme readers free P&P on any Froothie appliance including the Juisir. Add 2483 free ambassador delivery to the comment box when ordering to get free postage and packing. Delivery will be credited back onto your card. This sounds delicious Choclette – do you put the carrots in whole or do you chop them up first? I’ll have to give this a go. Good point Mandy. I’ve amended the recipe. I half the carrots, unless they are huge and then I’ll cut them into three. I used to bung them in whole in my 9200, but I’ve not actually tried in this one. It would probably be fine. I know what you mean about trying to use up all the carrots in a veg box. I also end up putting them in smoothies and juices. I haven’t used my juicer for ages though as I can’t be bothered to clean it, so I’m seriously thinking about getting a Juisir! The carrot conundrum! The Juisir sounds seriously good – tempting indeed. I think you should do a post guiding us though how you eat so many veggies Angie. I love veg, but find it difficult to eat that much every day. As for smoothies, I just bung everything in the blender and walk away to do something else whilst it’s blending. I have just spent couple of days in London on mini break with kids to go round museums etc. We also indulged a bit, food wise, and although it was really only 1.5 days we came home this evening and I felt like I need something nourishing! Your smoothie would be just perfect! I love adding ginger to any juice/smoothie type of concoctions and carrots are the perfect base, one to try! I know what you mean. I always feel like I need something uber healthy when I’ve been away. Sounds like you had a fun time though. Love love love this juice! Carrot & ginger is such a great and super healthy combo! Thanks Andrea. Carrots, ginger and orange make for a tasty and nutritious combination. What a lovely smoothie recipe. And the Jusir looks amazing! Thanks Kate. Carrots lend themselves particularly well to smoothies. I doubled the amount in our smoothie this morning and it was ace. Thought I spotted the colour of turmeric in the mix! Love the combinations of flavours used in this smoothie and can’t help but get excited about the Juisir either! I am SO excited by the concept of the Juisir! My existing Froothie Juicer is perfect – apart from the cleaning. This will be a game changer. It sounds quite amazing Claire and actually makes me want a juicer for the first time ever. That is one healthy smoothie and it must taste amazing. Great for fending off colds too. The Juisir sounds like the perfect juicer. I try and make my morning smoothies into tasty immune booster – you’re not welcome here colds! As for the Juisir, it sounds amazing. I love the sound of the juicer and the fact that you can use the bags. The carrot, orange and ginger combination is a win win in my book any day. Thanks Nayna. Luckily it’s a win win in this household, which is just as well as I’ve been making it a lot lately. The reusable Juisir bags is a definite bonus. Love the idea of carrot, ginger and orange. The Juisir does sound amazing – love that you don’t have to clean it! Thanks Jan. I’ve been drinking a lot of this smoothie recently – I seem to have an almost permanent excess of carrots 😉 The no-clean juicer almost sounds too good to be true. I love carrot, ginger and orange smoothie! The addition of turmeric is so clever! Going to make this juice this week. Oh, that is lovely. I really like to put a lot of veg and fruits into my daily diet, although it is a bit more expensive to eat a lot of vegs and fruits. That is a lovely smoothie. I have to try a bit more things along that line. This sounds really lovely, and I LOVE the idea of a self-cleaning juicer! My masticating juicer hasn’t been used in months and months because it’s such a faff to clean! I’ve been having this smoothie a lot recently, although I do interchange it with an old fashioned green one. The self-cleaning juicer is such a clever idea.